Can you believe it’s already that time of year to start thinking about Brisbane’s annual Mercedes Benz Fashion Festival? This year’s event is taking place between the 26th and the 30th of August 2018, so it’s definitely time to start planning. Once you’ve got your outfit sorted, you’ll have a great starting point to bounce around ideas for your hair and makeup look. Balance is the name of the game here, so if you have a bright, impactful outfit, you should pair it with a refined hairdo and makeup look. If you’re wearing something that doesn’t stand out as much, you’ll have room to go a little crazy with your hair and makeup. If you’re struggling to come up with ideas, take pictures of your outfit to your hair and makeup artist and they’ll be able to give you styling advice. Note: It helps immensely if you’re wearing the outfit in the photos, so they can see exactly how to work around the neckline and overall shape of the clothes. We’ve written up an entire blog post about how to make your event look last – you can read about the details here. For a quick summary, remember to exfoliate your skin prior to makeup, use a great primer, invest in a setting powder to take with you to the event, and avoid washing your hair on the day (second or third day hair is easiest to work with). 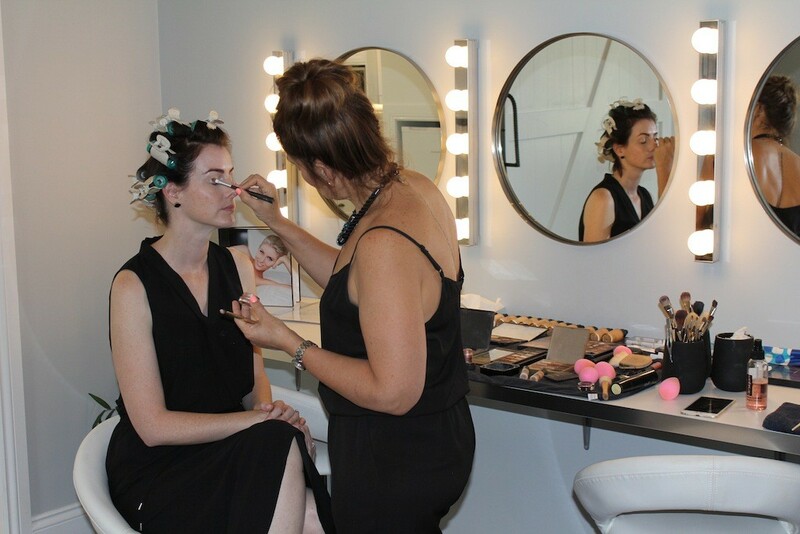 We also had a chat to Brisbane fashion icon Brooke Falvey about her tips on preparing for a big event. You can read her advice here. One of our favourite hair and makeup looks from last year’s festival was the one used in the Pacific Fair Fashion Show. Voluminous, 80s style hair with an elegant middle part was paired with bright and playful makeup colours. The model in the photo below wears a beautiful Bul outfit. We also loved the wet-look used by Mara Swimwear in the Next Hotel show. Slicked back hair and a dewy makeup finish was used to create that just-stepped-out-of-the-pool appearance. To make sure you secure an appointment ahead of Mercedes Benz Fashion Festival 2018, get in touch with our hair and makeup artists as soon as possible. It can be a pretty hectic time of year for us, so the sooner you book in, the better! You can call us on 0433 414 141, or send us a message using our online enquiry form.